Thanks for finding your way here! I’m an artist based in Surrey. Over the years my wife and I have visited high street galleries from time to time browsing for paintings for our house or just to look at cool new art. I nearly always found myself saying to her “I could do that”. One day she called my bluff and said she didn’t believe me…and that I should prove it! This was a seminal moment and I went home, cracked open an old watercolour paint set and painted for the first time in many years. I quickly rediscovered how much I enjoyed the creative process and my wife was very impressed with the end result…although it looked pretty messy to me! Since then I have been painting most weekends and evenings building up a body of work. People started to get word that I was painting and their positivity was infectious and spurred me on to paint more and more. 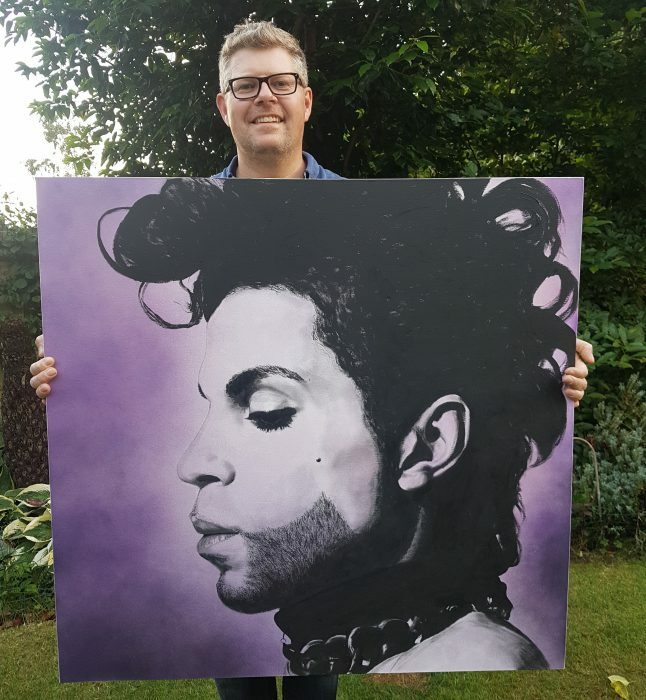 I even got commissioned and sold my work which was exciting and gave me the confidence to create even bolder and larger scale portraits. I’d always been pretty decent at art at school. However at the pivotal point in my education when I needed to make exam choices I unfortunately was being taught by an art teacher that I just couldn’t relate to* (*the polite version!) and therefore chose not to take Art for my exams. The school rightly felt I should progress with art….but I didn’t. Post-education I worked (very briefly) in the corporate world. The corporate world was clearly not for the artist in me however and thankfully my design skills and a leap of faith from an employer got me into the creative industry and I never looked back. So not having pursued the academic side I don’t think I’m your textbook artist. I like to create paintings that capture a moment in time or a likeness of a celebrity that makes a connection with the person looking at it and makes them smile. I love the challenge of painting, especially tricky commissions when I’m asked to paint a person, celebrity or image perhaps that I wouldn’t have chosen necessarily myself. Have a good look around the site at my artwork. Don’t be shy – please come and say hello on one of my social media pages. I do my best to reply as often as I can so let me know what you think!